Lydbilde 001. Square shaped lathe cut 8″ in handmade paper sleeve. Edition of 30 numbered copies. Domestic Dwellings is a new studio project by Kobi and Alfabulator band mates Petter Flaten Eilertsen and Fredrik Ness Sevendal, featuring lo-fi recordings of feedback-drenched guitar drones. Petter records solo as Love Hz and Gabriel Mørk. He also plays in Dip Apple, Heaven’s Gate Away Team, Phonoloid, Romklang, Taperne and various other projects. Fredrik’s solo project is FNS. He is also a member of DEL, Layers Of The Onion, Slowburn and many other projects. Lydbilde 002. Heart shaped lathe cut 8″ in handmade sleeve with Plexiglas front and wooden back. Edition of 30 numbered copies. Marit Morell is a member of the band Children And Corpse Playing In The Streets who is going solo with a music project related to her works as a video artist. Her music is improvised and based on the experiences of exploring natural phenomena and is meant to be as raw and real as the videos. 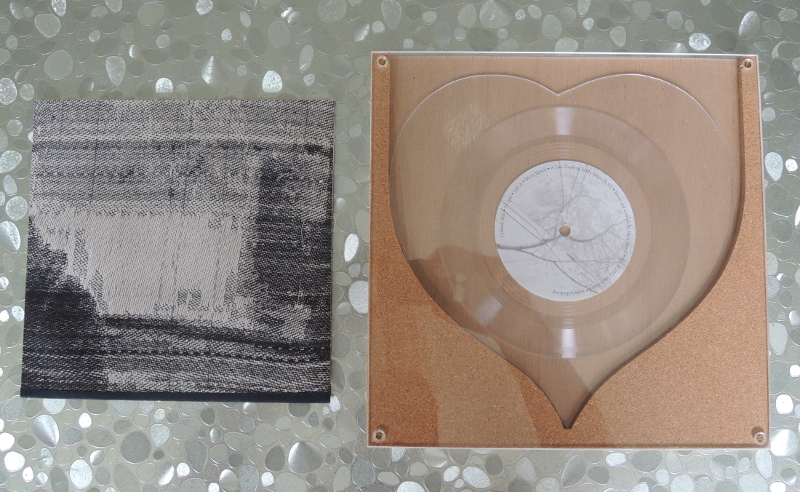 Both releases will be for sale at the release party at Sound of Mu in Oslo tonight. NOK 300 per copy or NOK 500 for both releases. Only one copy of each release per customer and cash payment only! If any copies remain after the release party they will be made available via the Lydbilde website. Marit Morell and Domestic Dwellings will play a short set together at the release party. Free admission.